My name is JD Guerrero but many know me as Coach G because of my background as a PE teacher and coach! I am also the owner of Only The Strong Fitness & Athletics. We are the brand that gives back! Checkout my website to find out more, www.onlythestrong.org. As a small brand and business, I was looking for a way to reach more people beyond the community I live in. I wanted to network with other similar fitness minded people to learn from their experience of expanding their business and their tips for success. I was also looking for people to help me share my story and I share their story. So, I decided to take a chance and do something about it! I was scrolling through social media and kept seeing a post from fitness friends that were going to be attending this Fitposium event. I started to read about what it was and decided to give it a shot. 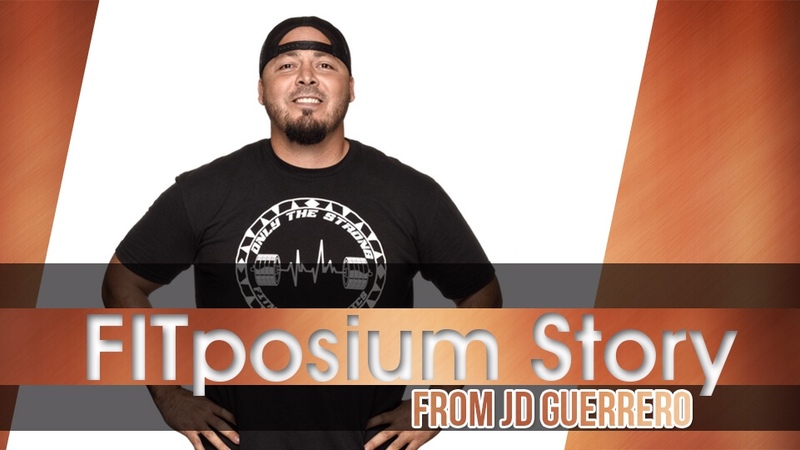 FITposium is an annual conference and online education network that provides you with all the information, connections and opportunities to catapult your success. Learn how to turn your passion into a profitable profession at FITposium. I attended the 2017 Fitposium event and it was an amazing experience for me and for my OTS business/brand! It was located at a very nice resort in Scottsdale so it was very comfortable and included snacks and beverages for us at any time. The guest speakers were all phenomenal. Some were celebrities that shared their story and what they did to become successful. They gave great useful information on various aspects of what we could use for our business, from presence in social media, how to build your website, how to market your products and so much more. They had remarkable magazine editors, portfolio reviews, and casting calls on site. I was even able to take some pictures with a professional photographer and keep for my personnel use. I met so many others at the event that I have been able to connect with and collaborate with for our businesses. Overall, it was a great experience. Many positive things and opportunities have happened since becoming a Fitposium Pro! I was able to share my story on a Phoenix magazine. I have started to add new ideas to my website. I have increased sales on my OTS apparel and that helps me give back to our community, including youth sports, equipment, and active family events. My social media numbers and interactions have picked up. I also have added an OTS You Tube channel for most of the videos that I share and include posts about others that use and support OTS apparel and showcase community events that we are involved in. This year at the 2018 Fitposium Conference I look forward to gaining more knowledge on all aspects. I look forward to meeting more awesome people! I look forward to sharing my story and my brand with more magazine editors and make it on those magazines! Thank You Fitposium for all that you have done to make me a Pro and for letting me share my experience!